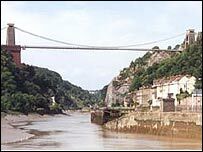 The Clifton Suspension Bridge in Bristol made a loss of more than £600,000 last year, it has emerged. The figures were released at a public inquiry, ordered by the government, after objections to plans for a rise in the toll for cars from 30p to 50p. The clerk to the trustees said that a loss of £100,000 was forecast for this year, and further deficits of about £350,000 in subsequent years. The National Alliance Against Tolls claims the trust has large reserves. The bridge trustees said the rise is needed because of increased insurance charges, the cost of new lighting and the discovery of voids under one tower. The toll charge for cars last rose in 2003, from 20p to 30p.